Kashmiri bead, often confused with "lac bead" due to its similar appearance, is made of polymer clay (generally marble powder) mixed with hardener and resin (semi-liquid adhesive) which is hand-decorated with faceted glass chips, rhinestones, seed beads, small brass/metal components and other various accessories. Each individual bead is unique. Trans Colored Luster Lined Beads are those dyes which require a mordant in their application and which upon combination with the mordant deposit insoluble color on the substrate. We specialize in various kinds of beads like silver and golden beads, lac beads, plastic beads, seed beads, glass beads of sparkling color contrasts. 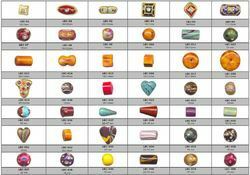 These are used to make stunning collection of bracelets. 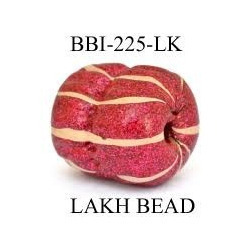 Lac Beads are made of lac material, ball chain and colored grain, lac beads are handmade, we produce hundreds of designs of lac bead.